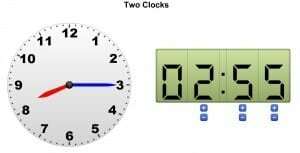 A New lesson on time measurement in honor of Daylight Savings! It’s that time of year again for us all to set our clocks back an hour; this presents a great opportunity to teach your students more about the concept of time and time measurement. We have created a new lesson on calculating elapsed time, complete with multiple word problems testing their knowledge on the subject. This might also be a good time of the years to check out our classic tool, Two Clocks, for practicing telling time. Help your students understand elapsed time with our new lesson! This new lesson focuses on helping 2nd, 3rd, and 4th graders calculate elapsed time with multiple visual and word problems on the subject. The lesson includes 10 problems where students are given a situation involving time and need to figure how much time is involved in each occurrence. The lesson also includes links to other resources on this topic. Check out our new lesson! The Sun’s Apparent Path activity is an animation of the sun circling the earth. You can pause the animation at any time by pressing the pause button. Select a different season from the list in the box below the animation and see the results of the sun from a different angle. With this interactive activity, your students learn about the tilt of the earth and how sunlight casts different shadows during the seasons. As Daylight Savings Time approaches why not teach your students about telling time! Make learning to tell time easy and fun with our Two Clocks tool. This tool meets several Common Core standards and aims to teach younger students how to read time on both analog and digital clocks. Features include a random time generator, the ability to have times rounded off in different increments, and multiple options for how the time is displayed. The Telling Time activity offers clocks for your smart board that are suitable for an interactive lesson. The clocks consist of an analog or a digital clock with or without colored hands. The Clock Machine activity can be used as a math problem about what time it is or, to create an assignment about what the time differences are between the three clocks.